A & G Catering contribute over 30 years of catering expertise to your special event in and around Scarborough, offering outside and inside catering and also licensed mobile bars. 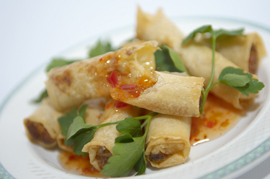 You simply supply the occasion and we will provide fantastic food to impress your guests. Our aim is to provide you with classic and modern foods through a multitude of lively, individual and sociable foods, by using local suppliers and the freshest of ingredients. We have a range of menus to suit all tastes, budgets and dietary requirements, or you can design your own bespoke menus. All you have to do is to choose from our delicious choice of menus that feature something for all tastes and then leave us to do the shopping, preparing and clearing up whilst you concentrate on entertaining your guests and enjoying yourself! We prepare your food at our premises in Scarborough, North Yorkshire then transport it to your venue in refrigerated vehicles. We also supply table linen, cutlery, exquisite crockery and glasses, mobile bars, portable refrigeration and kitchen equipment independently of our catering service or as part of your package.